With her slow-motion twirl at the Miss Universe 2018 in Thailand, Miss Universe 2018 Catriona Gray captured the hearts not only her Filipino supporters but also the universe. And to continue her success as the fourth Pinay to carry the crown, Jollibee welcomes her as the newest addition of the family. Catriona is the latest endorser promoting the newly improved Jolly Twirl. In her first-ever commercial for the proudly homegrown brand, Catriona shows off the twirl that sent waves on- and offline, all over the world: the iconic slow-motion twirl. Clad in white, Catriona talks about how the universe has spoken, referring to a new twirl that is set to win everyone’s hearts. For the 25-year-old beauty queen and singer, the “best twirl ever” is not her crown-winning move. Her face—lit up in desire and anticipation—and her elegant, seamless movements are in perfect sync with the irresistible twirls of the soft-serve ice cream. The new and improved Jolly Twirl comes with a thicker, creamier texture and a special formulation that makes it slow-melt so that everyone can enjoy it longer. It’s still the same delightful vanilla soft-serve ice cream generations of Filipinos have grown to love, but with improved characteristics to make for a better dining experience. 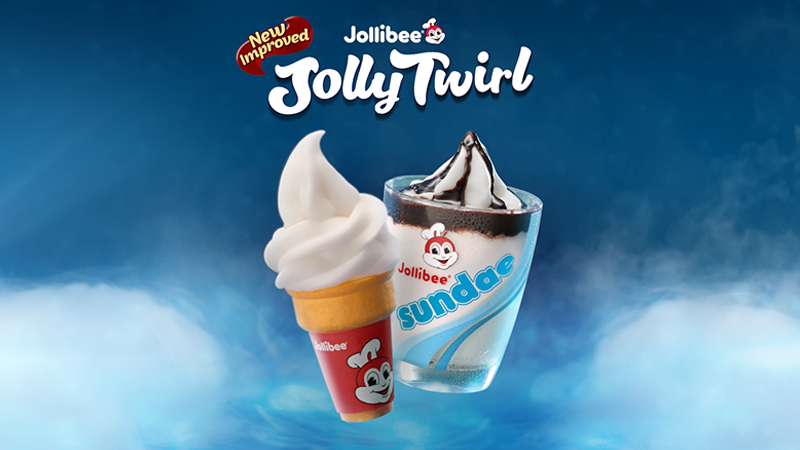 Whether you’re looking for a sweet way to cap off your favorite Jollibee meals or an indulgent treat to enjoy “just because,” the Jolly Twirl is indeed the best twirl for you. The Jolly Twirl comes in the following variants: the Chocolate Sundae Twirl (PHP 30.00), with the vanilla soft-serve ice cream complemented by a drizzling of rich chocolate syrup; the classic Vanilla Cone Twirl(PHP 10.00), with the thicker, creamier vanilla soft-serve ice cream twirled into a crispy cone; the Chocolate Cone Twirl (PHP 15.00), with the vanilla soft­-serve dipped in chocolate; and the Mini Chocolate Sundae Twirl (PHP 24.00). Available in all Jollibee stores for dine-in, take-out and delivery.